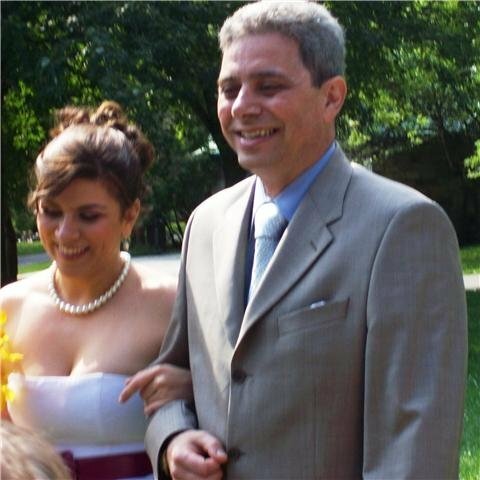 Me and Daddy-O on the big day. There’s no way to dress it up: I didn’t meet my father until I was 16 years old. Circumstances, more than anything else, had a hand in it. For most of my short life at that time, my father lived on Canada’s west coast while I lived in Germany. When I returned to Canada – on the east coast, mind – I was still too young to travel on my own. So when I was 16, I finally made the cross-country trek. Until then, I only really knew snippets about my father, mostly from my mother’s glowing reviews. He and I had also spoken on the phone a few times, but this was before phone cards, cheap long-distance plans and Skype. Otherwise, we’d gotten to know each other through correspondence. My mother had pictures of him, but they all dated back to 1975, a little before I was born. He looked like Cat Stevens, especially with a guitar in his hands. It struck me because it provided a clue about my own musical inclination. Back then, we were all so sure that I’d turn my years of classical piano training into a career in music. When my father and I finally met in person at the airport, he embraced me urgently, saying, “god, you look like me.” He was right. The rest of our 2-week vacation was largely spent pointing out our similarities and our uncanny body language (we seem to unwittingly cross our arms at the same time). But it was still a little awkward for me. Being in a household with no female presence felt uncomfortable. My father was no longer a legend. He’d become a real person, with all the flaws that being human entails. He started to look less like Cat Stevens and more like himself. And in all the important ways, he was a stranger. My father picked up on it and told me it was okay for me to feel weirdness or even resentment. I couldn’t really classify any of the emotions, so I swallowed it and told him it was nothing. So he swallowed it too. One thing I learned about him was that he loves jazz. He even had a show at the University of Victoria’s radio station. He called it Joe’s Garage (a playful cross between my father’s name and the Frank Zappa album). His show featured guitar jazz exclusively. Lots of Steve Vai, Chet Atkins, some Django Reinhardt and Béla Fleck. When I told him there were similarities between baroque music and jazz in that they’re both improvisational, my father turned it into a show, with me as the guest. I remember that he played Lenny Breau’s jazzy rendition of Bach’s Bourrée in E minor to draw the connection for listeners. Right after the show, we stopped by UVic’s repertory theatre, which was in the same building. This was exciting for me. We didn’t have that sort of thing in Moncton yet. And when I saw that they were playing Tous les matins du monde, with Gérard Depardieu and his swoonworthy son Guillaume, I begged my father to humour me. The next day, we attended the early show. I didn’t know much about the movie, but I’d heard about it, and Gérard Depardieu’s fame had somewhat trickled down to North America on the heels of Green Card and Cyrano de Bergerac. I knew it was a period piece, but I had no idea it would revolve around baroque music. The discovery delighted us both. Marin Marais faces his inadequacies in the last few moments his life lets him have. Tous les matins du monde is a fictional account of the lives of composers who actually existed. 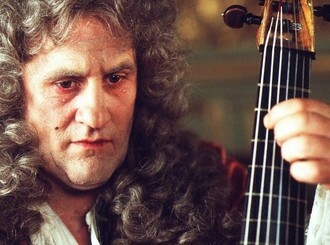 (Biopic filmmakers take note: themes are infinitely more engaging than “milestone moments.”) Gérard Depardieu plays Versailles court composer Marin Marais, and his son Guillaume plays the same character at a younger age. The movie has an exquisite opening shot, with the action happening off-camera. Knowing that death is closing in, Marais confides in his orchestra. He admits he’s an imposter, and segues into the tale of his aloof and temperamental music teacher, Monsieur de Sainte Colombe, played to pitch by Jean-Pierre Marielle. Sainte Colombe outranks Marais in talent, awareness and proportion. Marais knows this and spends his life trying to understand what Sainte Colombe has that he doesn’t. The set-up is similar to Amadeus, but unlike Salieri, Marais is clueless about his inability, in part because he’s in a hurry to get famous. “You’ll wear lovely robes, you’ll dance for the king’s circus. It might impress some but it’ll never move them,” Sainte Colombe predicts. “You’ll make music, but you’ll never be a musician.” Sainte Colombe isn’t trying to condemn Marais, but he knows that ambition stunts growth. If only Madeleine had listened to her father. To complicate things, young Marais has an affair with Sainte Colombe’s daughter, Madeleine, only to leave her for a woman more fit for the court. Madeleine, who had taught Marais for months after her father dropped him in a violent fit, retreats into a resolute sombreness that eventually leads to her suicide. Matins is also about mourning. Sainte Colombe owes much of his rage to unwavering grief over the death of his wife. It’s why he composes “Le Tombeau,” an opus of viol pieces. Himself a muted man, Sainte Colombe spends most of the movie trying to teach Marais that music replaces the words we can’t say, and says the things there are no words for. Of course, it isn’t until the end that Marais gathers all of his sorrows and weeps, with viol in hand, for his betrayal of Madeleine, for his decades-long ignorance, for the swanky court position he doesn’t deserve. He’s redeemed, just in time to die. The film’s title comes from a line in Marais’s narration. “Tous les matins du monde sont sans retour.” It translates to, “all the mornings of the world never return,” which is as poetic in both languages, and possibly the most apt description of regret. When the movie ended, there was a heavy silence in the theatre. I looked around and most people were teary, including my father. “I wasn’t expecting that,” he said. He and I spent the rest of the evening discussing the movie: its perfect soundtrack (mostly rendered by violist Jordi Savall), the way the cinematography mirrored baroque paintings, the fact that there really isn’t much dialogue, and the truth about music. I thought of the movie’s relationships, most of them entrenched in disappointment. Is it so different from how a teenaged girl feels about her parents? As an adult, I’m going to be pleased to put all that behind me. I’ll want to have a friendship with my parents. But at 16, I’m not there yet, least of all with my father. Later, I would learn that Guillaume and Gérard Depardieu had a tense father-son relationship, wrought with anger and envy, not unlike Marais and Sainte Colombe. When 37-year-old Guillaume Depardieu died of pneumonia in 2008, people disparaged Gérard for reading a passage from Le Petit Prince as his eulogy. They felt it was further proof of Poppa Depardieu’s rumoured heartlessness, without considering that it might have been too painful for him to speak frankly at his own son’s funeral. I suppose they would have preferred him to give the performance of his life. Family ties are complicated. Children go from needing their parents to wanting them overthrown, and that transition takes almost no time to occur. Naturally, it’s worse when children actually have a reason to begrudge their parents. It’s messy stuff, and I can’t imagine having to live it out in public. I didn’t want my father and I to have a resentful subtext between us. So eventually, I came clean with emotions I couldn’t comprehend or name. He was my father, but we didn’t know each other yet, and it would take some time. There was bitterness and confusion and love all at once. He graciously understood. He didn’t ask questions. He didn’t try to explain his side of the story. He just made himself available for whatever I might need. And I embraced it because I thought it would be a shame to root our relationship in regret. We had music in common. Isn’t that a good start? Daddy-O and I singing Karaoke to "California Dreamin'" at the reception. Family is confusing, in one word. I think you were wiser than you realized at 16. And that last photo speaks of so much. I am french and I’m actually in my last school year,” terminale”, and as you may know, in France, I have the BAC at the end of the year. This year, “Tous les matins du monde” book& movie are to be studied for this final-year exam and I would like to thank you for writing your feelings& comments about the movie for they were very intesresting and really helped me give direction to my work! I wish you a happy life with your dad, it’s a very pretty story. Livvy Jams: Bonjour Manon! Merci beaucoup de votre commentaire. Ça me réchauffe le coeur de savoir que j’ai un lectorat français. 🙂 Tous les matins du monde, c’est non seulement le film qui m’a rapproché à mon père, c’est surtout un chef d’oeuvre. Je suis heureuse qu’il fait sujet d’une analyse pour votre BAC. Vous allez vous régaler d’une méchante bonne discussion. Il fait jaser, ce film-là! Thank you for this, it was a very good read. I can sympathize with you, since I also grew without a father. Now that I’m a young adult we are in contact with and resemble each other in many ways, yet there is some kind of breach that might not grow because of “all the lost mornings”. I hold no resentment against him but am not sure if there will come a time where we will get to know each other. Your words gave me a lot to reflect on. As you said, family ties are very complicated. And yes, children do “go from needing their parents to wanting them overthrown”. It’s a very strange relationship, since understanding your relatives, their faults and their ambitions, is a way for understanding yourself too, right? Thank you again for the beautiful words. Livvyjams: Thank you for sharing your honest words, Antonio. I hope you enjoy Tous les matins du monde when you see it. Cheers!